Over 100 members of the intergovernmental Group on Earth Observations (GEO) concluded its 12th Plenary session and fourth Ministerial Summit in Mexico City with reiteration to unleash the power of open data in effort to address global challenges, reports NaijaAgroNet. This is coming as they have also adopted a 10-year Strategic plans to run between 2016 and 2015 in addition to a Ministerial Declaration that focuses on harnessing critical environmental observations to enable leaders to make better-informed decisions for the benefit of humanity at a time of rapid global change. 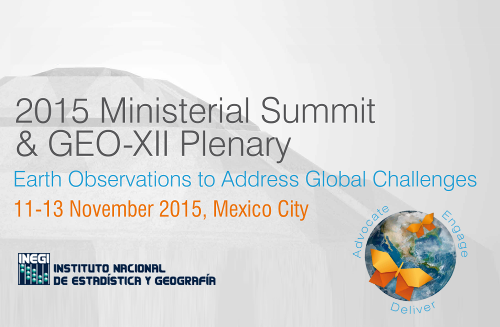 Arising from the weeklong meeting of over 400 delegates from 41 GEO governments and 39 partner organizations, and included Ministers of Environment, Science and Natural Resources, held at the Instituto Nacional de Estadistica y Geografia (INEGI), Mexico City, the leaders reaffirmed resolve to share data on earth observations at a time of exponential data growth, human development and climate change. Also GEO resolved that AmeriGEOSS, a regional programme to share Earth observation data for agriculture; disaster risk reduction; water; and biodiversity and ecosystem monitoring. The United States Interior Secretary Sally Jewell said, "As we near the historic Paris climate talks, it’s clear open data and international collaboration are key to countries moving the needle on climate change. We can and should share Earth observation data to help address climate challenges because science and open data are critical to understanding land, water, wildlife & climate change. They must be at the heart of every policy decision - no country can solve it alone." European Commissioner Carlos Moedas said, "We have reached a tipping-point where GEO has to move its focus towards successful societal delivery. We should not underestimate this formidable challenge. The European Union, through its Horizon 2020 and Copernicus programmes will continue to be a driving force to help GEOSS reach its full maturity – a GEOSS which is designed for and accessible by all contributors and all users." Communications Manager at Group on Earth Observations, Katherine Anderson informed NaijaAgroNet that GEO welcomed new Members Ecuador, Kenya, Somalia, Viet Nam and Zimbabwe, bringing the number to 100 nations; five new Participating Organizations: the Commission on the Protection of the Black Sea Against Pollution (BSC), International Research Center on El Niño (CIIFEN), Future Earth, Research Data Alliance (RDA) and The World Bank (IBRD/IDA); and four new Observers: European Severe Storms Laboratory (ESSL), Inter-Islamic Network on Space Sciences and Technologies (ISNET), the Organisation for Economic Co-operation and Development (OECD) and the UN Initiative on Global Geospatial Information Management (UN-GGIM). She also said that the Thirteenth GEO Plenary will be held in St Petersburg, Russia in November 2016.